"The Liebster Award is for blogs with under 300 followers and the rules of the award is that the nominee must link back to whoever nominated them, write 11 random facts about themselves, answer 11 questions from the award giver, and then nominate another 11 bloggers and make up 11 questions for them to answer. It's a great way for new and undiscovered bloggers to meet new people, get more followers and find some blogs that they want to follow." I have recently had the pleasure of being nominated for FOUR new Liebster awards! Wow. I'm having so much fun with blogging. I'm meeting lots of new bloggy friends, learning great techniques and tricks for better blogging, getting lots of new crafty ideas and generally enjoying my time in Blogland even more now that I have my own little space. I've decided to respond to my Liebster nominations over a couple of posts, two awards for each. I think that will allow me to give my award-givers and the awards themselves the attention they deserve. For this first post, I will respond to my awards from Elisabeth, at Elizy Art Crochet and Stephanie, at Crazylittlelovebirds. Thanks to both of you for my awards! Elisabeth and Stephanie are very talented and crafty, and their blogs are wonderful places to visit. Please check them out and say hello! 11 Random Facts about Me! 1. My very first celebrity crush started when I was about six, and it was on George Michael. I saw the video for "Wake Me Up Before You Go-Go" and I was in love with him for the next five years. 2. I still have all five of my childhood Barbies and their clothes and some of their furniture. 3. I rarely wear makeup, but when I do, I wear Clinique. It's one of the few things I let myself be snobbish about. I'm also a snob about mayonnaise: Hellmanns/Best Foods, or nothing. 4. My refrigerator is named Adele. It was delivered to my house the morning after Adele (the singer) won all those Grammy Awards and I named the fridge in honor of her. 5. A boyfriend broke up with me because he wanted to become a priest. He's a Jesuit father today. We're still friendly. 6. Every day, I drink two cups of tea from a giant cappuccino mug which was a favor at a dorm dance in 1997 and which I've been drinking from since the day I got it. 7. "Mr. Rogers Neighborhood" is in my top five favorite TV shows ever. 8. I enjoy doing the laundry. But I have pretended to hate it because that seems more normal. 9. I worked in grocery stores when I was a teenager and I can still remember some produce codes. 10. I don't have any tattoos and my only piercings are two in each earlobe. 11. I can recite the Preamble to the US Constitution from memory. 1. What is your favourite day of the week? Friday. My husband has every other Friday off from work because of the way his work hours are accrued, so we have a three-day-weekend every other week. "Fridays Off," as we call them, are very nice. We do things as a family and beginning with the coming school year (this August), we'll be alone together in the mornings on his Fridays off! Both children will be in school then. I can't wait. 2. If you were an animal, which would you be and why? I would be a house pet, I think. Maybe a dog or a cat, because I love to be at home and would love to be able to curl up in a sunny patch and take a nap whenever I wanted. 3. What is your favourite song? "One" by U2, since I was thirteen years old. 5. What are you afraid of? Medical treatment. Spiders. In that order. 6. If you could speak another language (that you don't already know) which would it be? Arabic. My mother is of Syrian descent and I always wished that her family had taught us to speak Arabic. I listened to them speak Arabic when I was growing up and I understood some, but never well enough to speak it myself. 7. What craft do you want to learn but have never tried? Weaving. I could learn, since my mother-in-law is an accomplished weaver, but I find it intimidating. I'm sure she'd be glad to teach me, but I'm afraid of doing something bad to one of her beautiful looms! 8. Which country do you most want to visit? So many, but I'd probably start with the UK because it's quite different from my own country but the language is the same. 9. If you had a day all to yourself completly free of responsibilities and things to do, what would you do? Sleep! Ha. Eat a quiet meal in a little restaurant, sew and crochet a lot, eat all the snacks I love, drink real Coke and not share with anyone, read for hours...this sounds pretty nice! 10. Do you have any bad habits? I pick at my split ends and touch my face too much. I was a lifelong nail-biter until about a year ago but crocheting has helped me stop. I hope to never start up again. 11. If you could go back in time and witness a famous historical event, which would it be? This is a hard one, it's difficult to choose! Seeing the first men walking on the moon would have been great; being alive during the feminist movement, especially for big events like Roe v. Wade would have been interesting, the ends of WWI and WWII..
1. Where have you recently traveled to? And did you enjoy your time there? My husband and I went to upstate New York in September for a friend's wedding. My husband was a groomsman in the wedding. The wedding was in the city we lived in when we were first married and where our son was born. I did enjoy it; it was a lovely wedding and it was nice to see our old friends but it also reminded me that I was glad to no longer live in that area. 2. Do you enjoy working out? And do you prefer working out morning/evening/night? Truthfully, no. I don't enjoy working out. I know that's not the right thing to say, ha. I do it because I should, not because I like it. I prefer to do it in the early morning. 3. Plain water, or flavored water? I haven't really tried any flavored water, so I'll go with plain. 4. Where do you currently live? Do you enjoy it there? I live in Albuquerque, New Mexico and I love it here. It's not perfect, but as transplants to the area, we have built a nice life for ourselves and found ways to live which suit us. 5. What season do you enjoy the best? I think it's a tie between spring and fall. 6. Do you enjoy gardening? Yes. I don't love the back-breaking parts of it, but I do find it fulfilling. If I could just plant, and harvest, flowers all year long, that would be ideal. 7. How many pictures would you say you have taken so far this year? Oh boy...close to a thousand? I take a fair number almost every day. 8. What's your favorite fruit, and why? Strawberries. I just love them, and have all my life. 9. Do you have a nickname? I have a few. Most people who know me call me Jenny, short for Jennifer. My father has always called me "Jenny Wren," or just "Wren." My husband often calls me by the nicknames "Thistle" or "Bee." 10. Do you enjoy doing home improvement projects? For the most part, I do. I don't particularly enjoy painting or heavy cleaning, but I like decorating and sprucing up. 11. Why do you blog? The primary reason is that I love to write and take photos of my life, and because I think it's important to take time to appreciate everything good about my life. Blogging is an easy way to do that. I also like to communicate with others who have similar interests and values, and share creative things I have done, and get ideas for new creations (and admire those others have made!). My questions for other bloggers! 2. What is your favorite movie? What is your least favorite movie? 3. Have you ever been on an ocean cruise? Where did you go? 4. What was your best subject in school? 5. Name three kitchen utensils you can't live without. 7. What was your most hated job? 8. Can you play a musical instrument and if so, which one(s)? 9. Can you roller skate? Skateboard? Ride a bicycle? 10. Who is your favorite character on the TV show "Friends"? 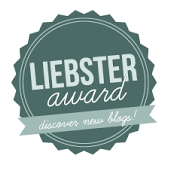 And now I'd like to pass the Liebster Award on to the following bloggers! Please take some time to visit these blogs, they are all interesting and lovely to read. I'll be posting soon with the responses to my other two Liebster Awards and more blogs I'd like to pass on the award to! Thanks for reading and for participating. Cool answers. I think you area very talented crafter and would be a terrific weaver. I say if you are truly interested go for it and do not let your apprehension stop you!! I loved reading all your answers - congratulations on your awards. Wow, this came as a surprise, thank you for nominating me! I love that you named your refrigerator. Not sure I could be quite as witty!!! Congratulations again! I have a few things in common with you but definitely not #5! Congratulations on so many awards! Lovely to find out a little more about what makes you tick. Wow, congratulations on your many awards. That is amazing! Thank you for nominating me :) I shall go and answer your questions now.